Metal maniacs, rejoice! I am proud to present to you: PYRAMAZE; signed via Inner Wound Recordings, hailing from Denmark grounds - performing Power Metal, on their sophomoric album entitled: “Legend Of The Bone Carver” (re-issued) (released February 15th, 2019). Since formation in 2001; the sextet in question have 5 albums in their discography so far, I am introduced to their 2nd album entitled: “Legend Of The Bone Carver”. 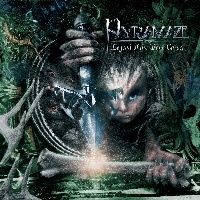 11 tracks ranging at around 50:74; PYRAMAZE arrange an intricately designed formula of heavy-hitting Power Metal developments, the operatic “Era Of Chaos” begins the record…citing both good and evil exists as it needs one and the other to subjugate those sins in a wave of war. “The Birth” conveys chugging frolicks of galloping stampedes; stomping with sonically savage seamlessness, rambunctious relentlessness and amplified adrenaline attributing an adroit aesthetic of boistrously bouncy hymns of hardened clarity – flamboyantly contrasting with concrete grit and meticulous manifestations. Consisting of frontman vocalist: Lance King; demonstrating high-pitched finesse, and vehement pipes of profusely robust ramifications. “What Lies Beyond” injects infectiously groovy catchiness, creatively combusted with complex dexterity from guitar duo Michael Kammeyer & Toke Skjonnemand. Distributing harmonious haste, dominating diligence and a host of dynamically blistering inventivity, juxtaposed with jumpy rhythms and rampaging solidity of salubriously versatile ultilizations that thunder with organic substance and riveting stability. Songs like “Ancient Words Within” & “Souls In Pain” chug with galloping distinctions; converged with chaotic mayhem, incorperating conceptual consistency & battering barrages of frenzied bolts of hammering innovation…culminated with exceptional songwriting stability. Powerhouse drummer Morten Gade Sorensen; pummels his steel with prodegiously wonderous weight, slamming persistancy and skill. The ballad-esquire “She Who Summoned Me” delivers a clichè angelic duet; flaired with a soprano ultimatum, while methodically lacerating with gnarly ripping that roars with rapidly swift nimbleness, polished with fluid efficiency and enlightening blasts of orchestral meatiness. Audible bassist Niels Kvist also contributes an aesthetic of collectively crushing abilities, and unique remedies that showcase progressively technical specialities. Where as the titular track embodies an elegantly exquisite formulaic of firepower; expertise, and quintessential musicianship. “Bring Back Life” supplies more memorably original craftsmanship, embellishing on experimental detail from keyboardist implementation from Jonah Weingarten – portraying uniquely unprecedented soundscapes and tempos within. “Blood Red Skies” (not to be confused with the JUDAS PRIEST classic) elements a borderline foundation of exceedingly captivating doses of talented rituals and primitively overarching storytelling segments , make this a glorified homage to old-school neoclassical roots. Ambient atmosphere, and bludgeoning characteristics balances a fiercely determined construction of distinguished malice. “Tears Of Hate” overall concludes the record on a high note; conjuring up screams of vengeance, professionalism and an empowering endorsement of traditional Power Metal excellence. “Flame And Retribution” is a featured bonus track on this version, and another impressively excelling instrumental. Bottom line; I discovered a band who certainly outdone themselves, and was definitely worth re-issuing - check it out.